Designed by a former pararescueman to be used by those who might find themselves in the line of fire; police, military, tactical groups and hunters. The pouch offers easy access to all essential items in case of an emergency and includes a blood stopper kit. 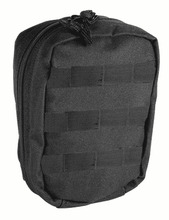 The Tactical Traum Kit opens to reveal two three compartments containing the following first aid supplies.